Japanese Binding – It’s Easy! 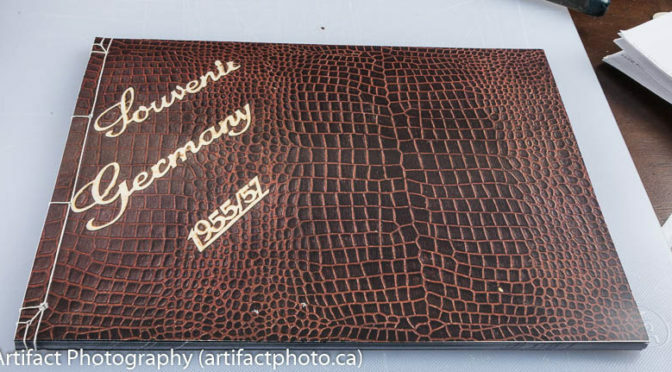 Ever wanted to get a book or an album bound. It’s expensive to get one done at the copy shop. Worse, it’s boring. A hand-sewn Japanese binding is the answer. It’s cheap, easy, and requires few tools. And it looks pretty darned cool! 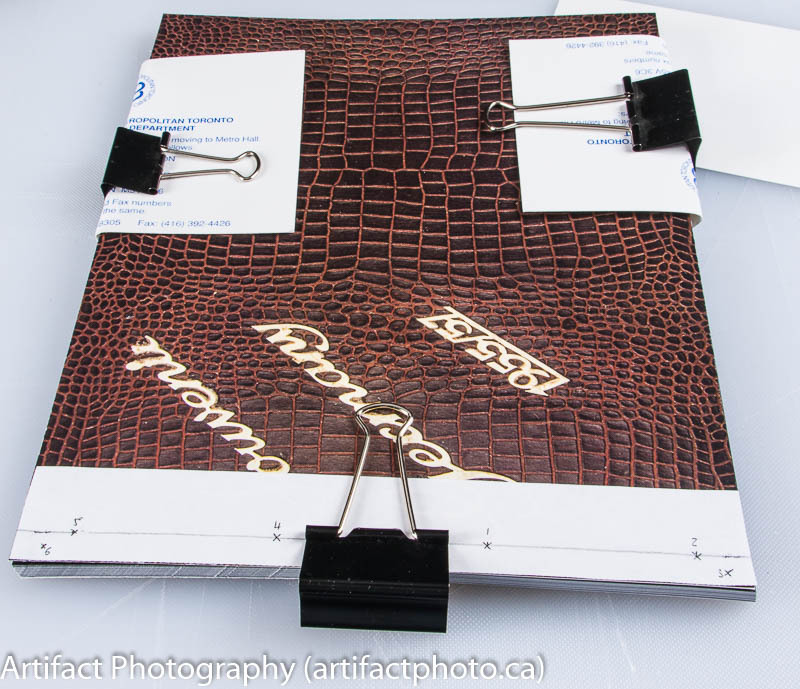 Photo albums: you can get them bound at a copy shop, or you can use the old shoestring binding. But you could save a bunch of money, and get something that looks unique. 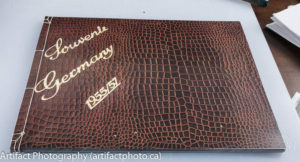 Th Japanese binding is one of the first bindings you learn when you take up the craft. The concept is you run a thread through the pages and around the spine several times, and once on the top and the bottom . This makes a binding that is solid. The pages cannot sag. And, you can experiment with a variety of designs, including multiple colours of thread. 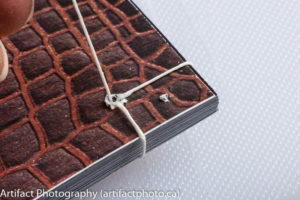 I’m binding the reproduced photo album I discussed back in How to copy a photo album. I’m using the Japanese binding with an extra corner square, because it’s pretty, yet manly enough to adorn a 1950s army album. I had the pages printed at my local copy shop. I had them trim the borders their equipment insists on adding. The loose sheets are all identically sized, unlike when I do it (I really should get a book plane). Most of these you already have. 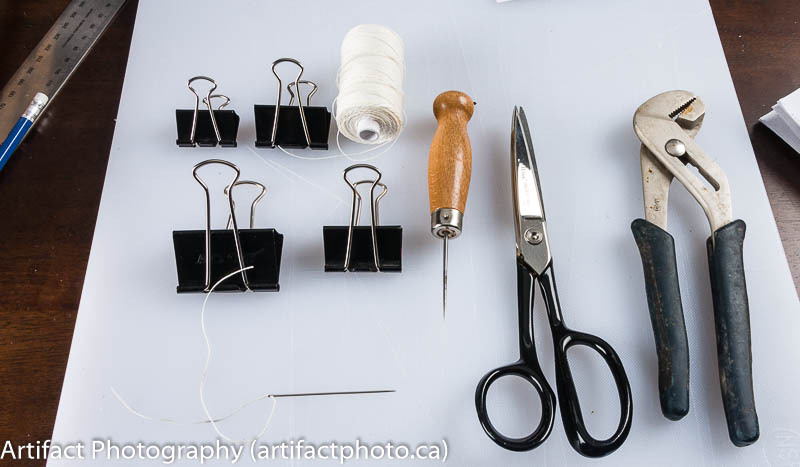 The needle and thread are available at some art supply stores, or online. I get my stuff at George Hill & Co (no I don’t make money on any references, unfortunately). 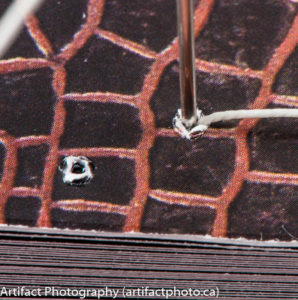 The pliers are handy for pulling the needle and thread through the holes. The holes get tighter as you reuse the same holes multiple times. Japanese binding is based on making four-holes in the stack of paper you want to bind. The holes are made 9mm from the spine of the book. The two at the top and bottom are made 15-20mm from the top and bottom edges. The other two holes are made by dividing the remaining space by three so they are equidistant apart. You can leave it at that, but I like to do a variation on it called the Kangxi Binding. It basically adds another hole at the top and bottom, equidistant from both the 9mm line and between the top / bottom edge and the nearest hole. I cut a piece of paper to use as a template, exactly the height of the book and about an inch wide (25 mm). 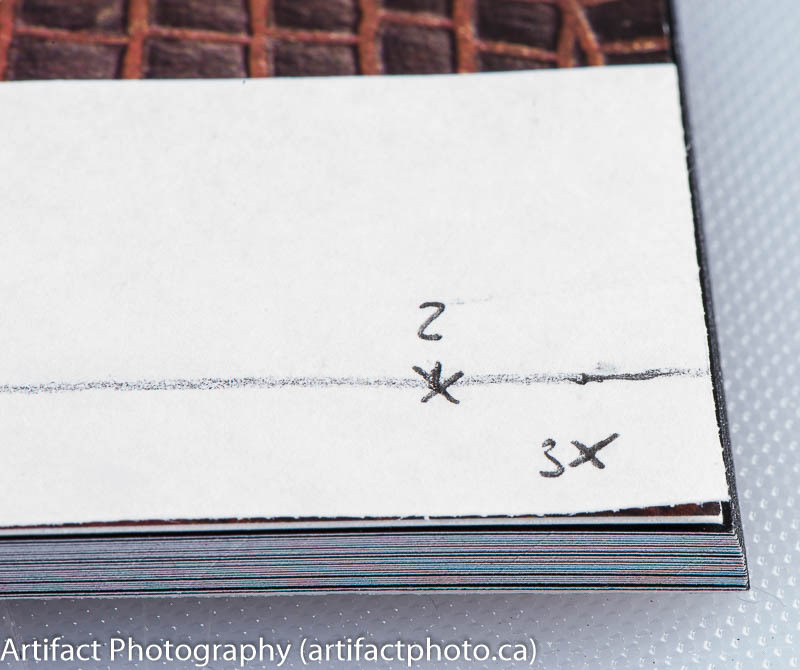 I draw a line 9mm in from the edge (spine), and the start placing dots where the holes will be. The result should match the photograph. I line up all of the book pages so they will be square, and I clamp them in place using spring-clips toward the opening edge of the book. I put scrap paper as a buffer between the covers and the clamps to reduce the potential for dents or scratches. This holds the book together while providing room to sew. I clamp the template to the spine edge in such a way that the holes are not blocked, ensuring that the template is aligned. I use the awl to punch holes through the pages into the cutting board. 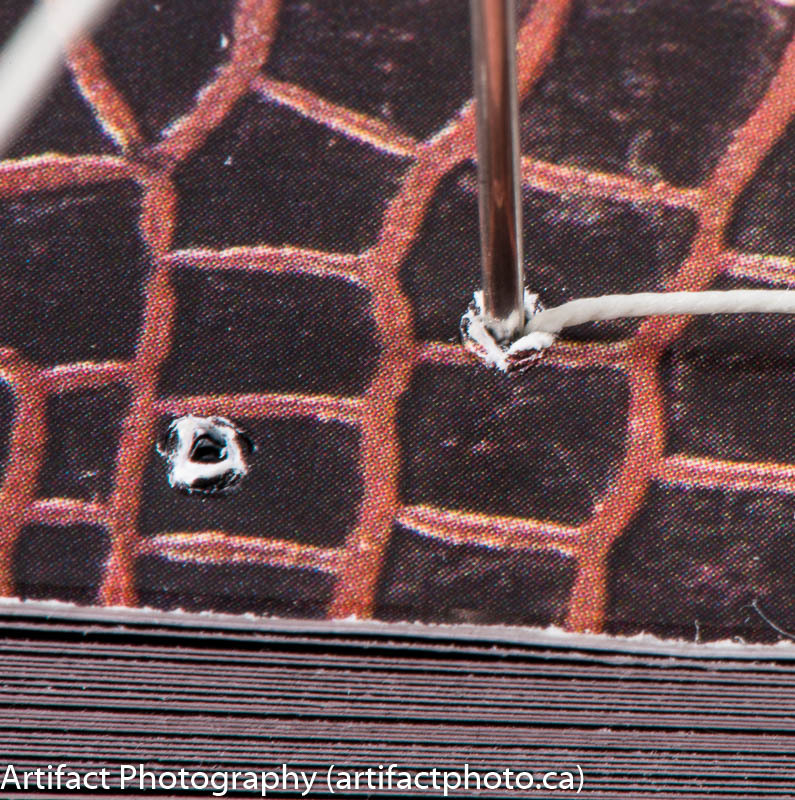 For a thick book, I will carefully ream out the holes by pushing the awl back through the holes from the other side. I start with the four outer holes, then with the awl still in one of the holes, I move the clamp to an outer edge. This lets the pages lie flat so the awl punches the two middle holes straight down. I start sewing at hole #1, but starting the needle about halfway through the stack, aiming toward the back. I leave enough thread hanging out the spine that I can hold onto it, so it doesn’t pull through on my next pass. The needle comes out the back of the book, and then around the spine, entering the stack again in the same hole, this time through the front cover (hang onto the tail). The needle comes out the back cover again, and this time heads to hole #2, down at the bottom corner. Again I loop around the spine and through the same hole. I then loop around the bottom and back into the same hole. From hole #2, I head over to hole #3 and repeat the corning process from that hole. When it is complete, the thread is on the opposite cover than the one hole #3 was started on, and I head back to hole #2 for the fourth time. From hole #2, I head for hole #4 and loop around the spine like I did on hole #2. I then head for hole #5. Hole #5 is a corner and is done just like hole #2, with a stop off at hole #6 just like hole #3. Once hole #5 is penetrated for the fourth time, I head back to hole #4, and then hole #1. The needle goes all the way through hole #1 and then loops around all of the strings on the back cover (I should be back at the back cover again) to tie a tight little knot. 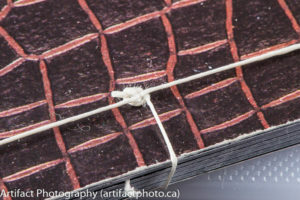 I trim the excess thread from the knot at hole #1, and tuck the tail inside the book by shoving it between the pages with something thin. So, in thirteen steps, in roughly 15 minutes, I’ve bound a photo album attractively and securely, without using glue. If the string ever breaks, it is a reasonably trivial task to resew. There are many variations that can be made, and you can invent your own. I’ve seen versions done with different colours of thread, different spacing, and additional holes. All are variations on the basic four-hole binding. 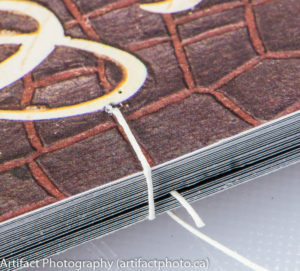 The main disadvantage is, just like any side-stitched binding, the book will not open flat. As I mentioned at the beginning of the year in Hello world! my sabbatical is nearing its end, and I must return to my day job. I won’t have time to put this out weekly anymore, but I do hope to get at least one out per month. This blog is published the last Monday of each month at 9:00 am, Eastern Standard Time. If you have comments, questions, or can think of a better approach, feel free to leave a comment. I’ll try to get back to you with a pithy answer.